LONG BEACH— I had the pleasure of watching old faithful last night. Like clockwork the Cubs closed out the century mark on consistent failure. This was the first time I’d been to a post-season clinching series victory. The atmosphere was electric. There was one blight on the night. The Dodger fans who created the electric atmosphere also provided a series of violent acts towards the fans of the lowly Cubs. Fights, brawls, and insults were hurled at the Cubs fans. I was prepared for this though. Dodger fans tend to be the lowest common denominator of civilization. I have yet to go to a Dodger game where some belligerent soul wasn’t hauled away in handcuffs. Last night was no different. 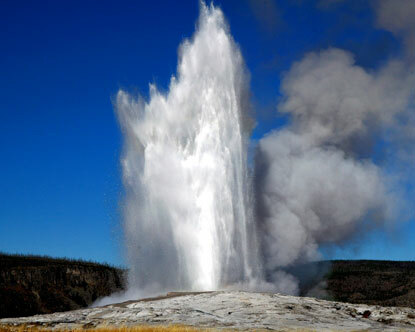 Nevertheless, it was exciting to see old faithful go off. I had been hoping for the Cubs to get right to the edge only to give it all away. They didn’t fool around this series. Slugging lead-off man Alfonso Soriano managed just one hit between four strikeouts in the series. The infield managed to create errors at each position in game two. It was a total meltdown. No pitching. No hitting. No fielding. All in true Cubs form. I was able to survive the gauntlet on the way home, maneuvering between cars, beer bottle projectiles and the concrete and steel of the Southern California freeways. It was at this point that the shock and awe could be seen. Not more than a few hundred feet from my house an SUV packed full of drunk Dodger fans ran a red light, collided with a mini-van, launched through the air, took out a traffic signal then a tree and came to an abrupt stop on a concrete wall topped with an iron Gothic style fence which impaled one of the passengers, left three in critical condition and the driver in prison. The entire event could have been avoided. 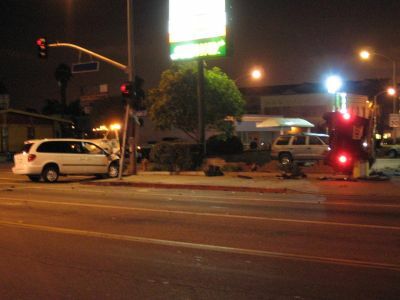 It was a stark reminder of the foolishness of drinking and driving. What made it all the more depressing was standing there helpless watching as the emergency crews did all they could to save the passengers. I watched the whole event, all the way up to the removal of the vehicles. Two young men strolled up to enquire about the incident. I recounted what I’d seen and heard. Then I found out it was their friends. They never made it to the house and these two guys went looking for them. What should have been a happy night for Dodger fans came down to tragedy. What an adventure, Paul! There’s nothing like a bunch of drunks to put a pall on an event. Betcha dimes to donuts one of them will say “We were just having a little fun…” Will they every learn?! The Cubbies. There’s just nothing to say about them. sigh…. Dodger fans – or any uncouth drunks: it’s hard to realize these same people are the ones we see in their businesses every day, who advise us on our insurance, or investments, or prescriptions, buy groceries from, etc. It’s at the ballgame or other places where they go “to have a little fun”, “relax and blow off some steam”, etc. where their true selves are seen. What a shame boorish behavior is unrestrained these days. Thanks CL. Yeah I couldn’t believe it. I had just pulled up to my house after deciding to walk down to the pub for a night cap. Had I continued and drove I would have been one of the victims. It was sad to see. The guys were all around 21. And I mean that in the sense that I was not drunk, or drinking and driving. Just wanted to toast to the victory with my friend. Just crazy. We went down there today to look at the aftermath. It was sad. The blood everywhere. It was sad. What, no congratulations for the Red Sox? Let’s go Red Sox!!! No congrats for the BoSox. I don’t like the Red Sox. I do look forward to the ALCS and I hope the Rays win. sore losers aren’t they lw?